all the way from India. She specialises in massages, ayurvedic facials,, threading, waxing etc. A young, petite, soft-spoken Zarin, invited me to try-out her Gold Facial that she is currently offering. A treatment new to South Africa, the Gold facial is a huge hit overseas. The Gold Facial, based on Ayurveda, is a powerful anti-ageing treatment, with revitalizing and rejuvenating effects. Gold is one of the softest metals and is easily absorbed by the skin. It helps lymphatic drainage and facilitates the removal of toxins and wastes. It also stimulates blood circulation and improves skin elasticity, accelerating cell renewal and reversing oxidation damage. 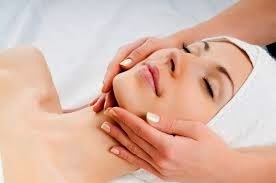 A deep cleanse facial including steaming and extractions. A super facial cream massage. Last but not least the 24 carat facial gel and eye gel. As an added bonus we get treated to an amazing Hand & Arm + Half-leg massage. Don't be fooled by the modest set-up, Zarin is an excellent therapist. And this amazing facial package leaves totally revitalised. My skin feels and looks amazing. The glow is clearly visible. Marks & pigmentation is clearly lightened. Skin feels and looks tighter. Fine lines are less visible too. I can't wait to see the long-term results.